I've read that Lisbon is one of the harder cities to travel to as a coeliac, but after visiting I really don’t think this is the case. 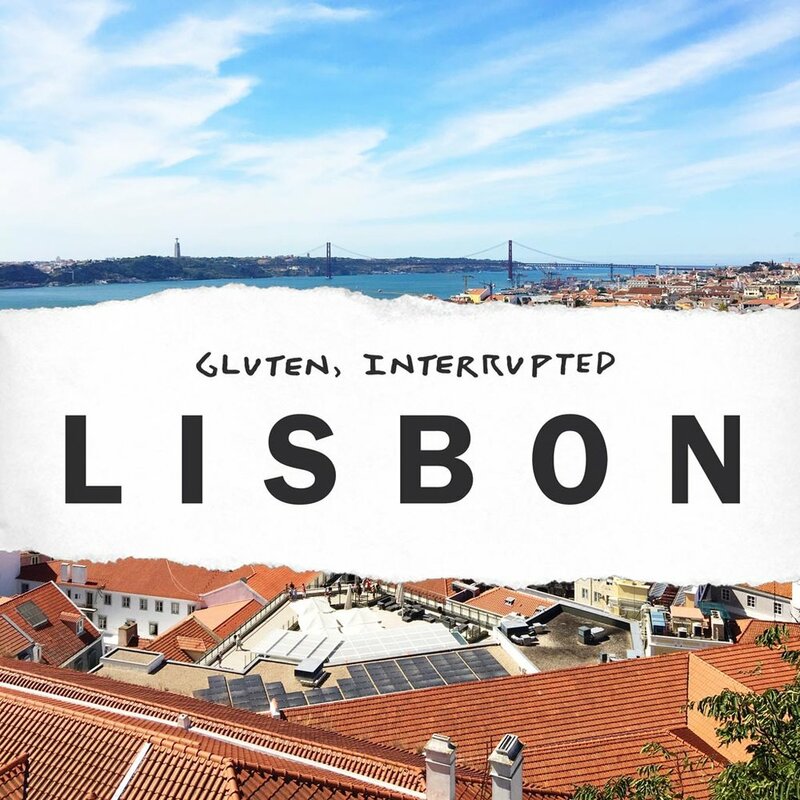 With this gluten free city guide for Lisbon, you should be hurtling about the city with a good amount of options available to you, living your life gluten free whilst eating pastries and supping on green wine. Pourover coffee and gluten free choices are creeping in amongst the Pastel de Nata and strong pingado (little espresso with milk) but there's still a ways to go yet. This is an amazing coffee roastery and cafe that understands gluten free, there was only a gluten free carrot cake muffin available when I visited, but it was excellent. The coffee is the main attraction here and the service is spot on. Definitely one of the better spots to plan the rest of your day with flyers of interesting local stuff going on too (not the average kind). A very quaint and unassuming little cafe with a good understand of what is and what isn’t gluten free. When we visited they had one option for everyone - a set brunch, but it was delicious. To start we had some natural yoghurt with apple sauce (served sans granola) followed by scrambled eggs and a lovely little selection of roasted vegetables (without the bread). To top it off you get an iced tea included and the service is incredible. This place also sells tasty looking gluten free cakes but we were far too stuffed from brunch to try. Join the club, get yourself a genuinely good gluten free Pastel de Nata. I almost cried at the crumbly pastry. They also do a range of basic looking lunches and snacks, but the bakery is kind of the main attraction. The coffee here is the strong Porto type. Aussie style brunch and coffee spot The Miss is the perfect place to pick up GF avocado on toast, good veggie options (so ignore the bacon you can have halloumi). If you mention you’re coeliac your bread will be toasted separately PLUS they have banging coffee. 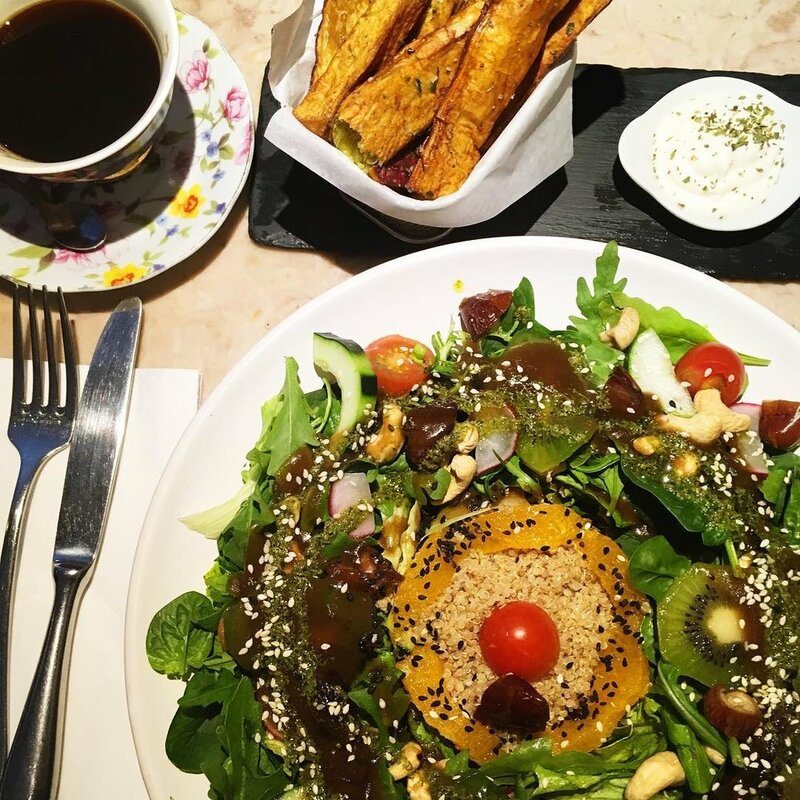 The Food for Real is a charming veggie/vegan breakfast/brunch restaurant near the LX Factory. The service we received here was second to none and the food was great. If you get the brunch plate you get 3 courses of brunch, including a delicious tapioca pancake, a juice, a yoghurt AND your choice of cake. I highly recommend stopping here before a visit to LX! 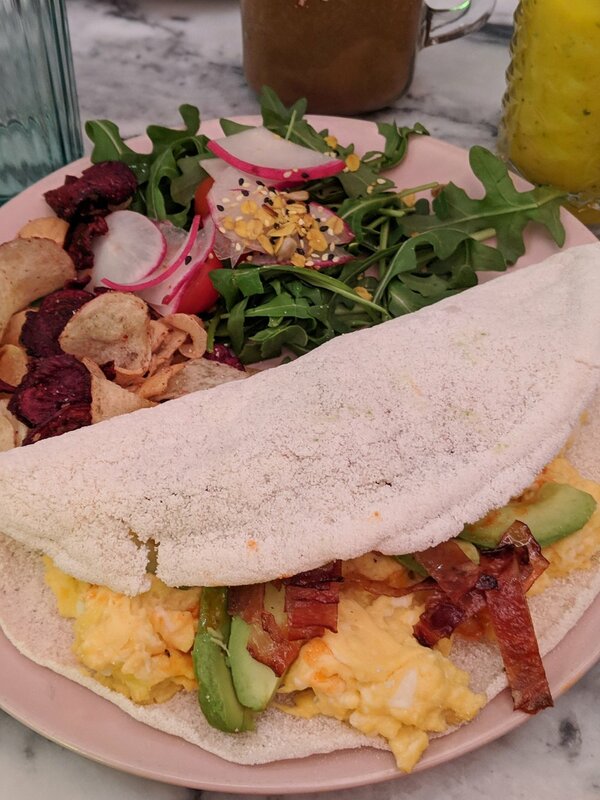 Part of the I Love Nicolau chain Basilio has a delicious selection of gluten free brunch. This tapioca pancake with scambled egg, avocado and bacon was delicious. Make sure to pick up a juice AND a coffee because both are great. Unless you want salad there aren't too many options, but you can always grab some piri-piri chicken. I'm not sure if this actually was the name of the restaurant or the flower shop to the left as you walk in. The cafe serves a range of gluten free suitable salad and the venue mentions it gluten free credentials on the window. 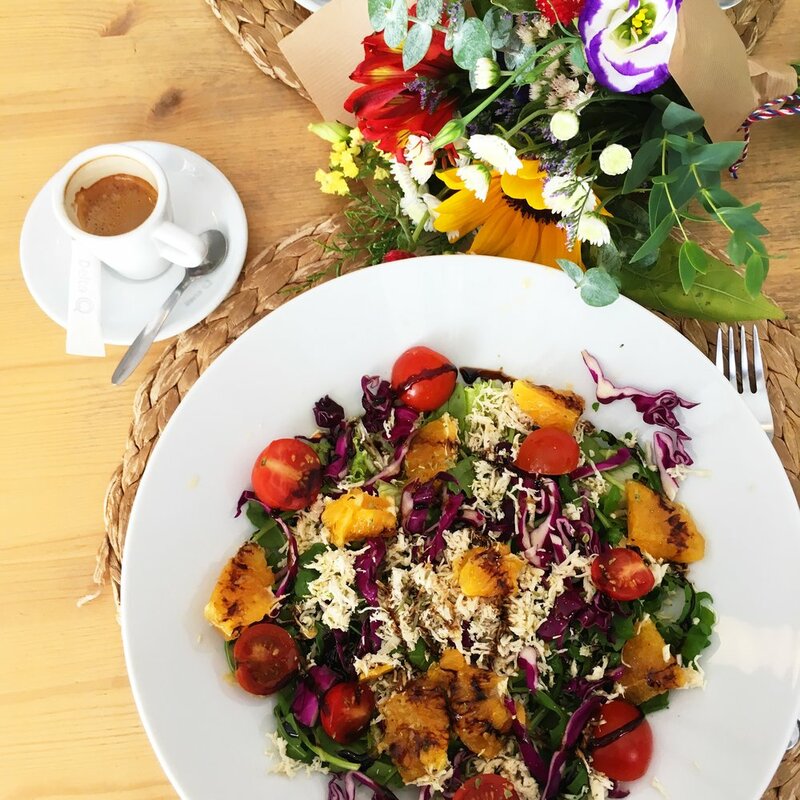 One of the best things about this place is the setting, you're sat on tables in the front of the shop, at the back is a curated selection of really interesting Portuguese products and there's the florist who's thoughtfully bunching flowers while you eat. The food is really well priced, a salad costing about 5euros and an espresso about 70cents. I loved the place for it's charm and attentive staff. This much hyped restaurant is one of the only vegan options in Lisbon, in my past experience, dietary preference restaurants are usually allergy friendly too. At AO26, this is not the case. Reading the Google reviews you'd think the food served is going to redefine eating, but when there's only one salad option on the menu as a gluten free option, you're expecting a miracle. When the tropical salad arrived, it was lathered in balsamic vinegar which wasn't even mentioned on the menu, and the only thing I could see was a 3 layer deep stack of fruit on a bed of unseasoned quinoa. If you're on some kind of seasoning free diet, get yourself there. Otherwise, opt for the sweet potato fries which are excellent. Not a whole bunch of GF options (unless you like seafood - I don’t) but managed to pick up this chicken pad thai which I enjoyed. Make sure you ask around as this had changed from my 2017 visit. There are some diverse options for dinner in Lisbon, I'm sure almost anywhere you go will have something on the menu you can eat. These are my top picks. Palacio Chiado is a fancier Timeout style food market, it’s smaller but much plusher and has swift table service. The outside menu didn’t appear to show much in the way of gluten free food, but the building was so intriguing I decided to go in for a drink anyway. To my surprise, there was actually a kitchen devoted which had a selection of GF/DF foods. I tried the chicken curry and whilst not photogenic, it was delicious. The food is really good and there’s a wide selection of gluten free options even if you’re not into fish (which I’m not). Finding a table upstairs is harder than down… but, if you can, try and get a seat on the little balconies for lovely views over the park. Don’t order the Mexican Negroni — the other cocktails are amazing though and the classic Portuguese egg and butter truffles are all gluten free and taste incredible — I had them all. This is a tried and tested chicken joint — you’ll definitely see lots of reviews and recommendations for it. Whilst not a fancy place, the price reflects that and you get a lot for your money. The service, while brash and slow is definitely bearable considering the food is delicious and gluten free! There are others online who have been here but I decided to use the gluten free card (available below) to confirm it’s was all GF. The spatchcock chicken is cooked on a spit and the French fries (which go perfectly) don’t have any cross contamination issues in my experience, but always double check in case they update their menu as it’s not labelled gluten free. This is one of the few restaurants that is promoted as safe for coeliacs online with a wide range of gluten free options available. The setting is very Italian and the food perfectly simple with very good fresh ingredients. For a dressier night out you can go here for dinner — everyone seems to know where this restaurant is and booking isn’t essential. Make sure you let the waiter know you’re coeliac on arrival, in order to get the GF versions of the bread (rice crackers and a decent roll) so you can try the truffle ricotta dip. I opted for the gluten free version of their Rigatoni Al Tartufo and truffle dish - it was absolutely delicious. They also had a selection of gluten free desserts, but too much wine and pasta meant I had to pass on those. There is a gin bar and they do permit smoking inside if that’s your thing, the restaurant is so well ventilated that you never notice the smoking and it seems to be something that’s mainly around the bar if it bothers you. My clothes didn’t smell of smoke when I left. Upon arrival I asked if they offered anything gluten free and was met with a no. On further inspection of the menu I noticed they did risottos so decided to ask if those were GF. They only actually do 1 type of risotto which is gluten free and it was salty and delicious. The setting is charming sat by the cathedral and as long as you don’t mind waiting a bit for the table service, it’s worth eating here if you’re staying nearby. 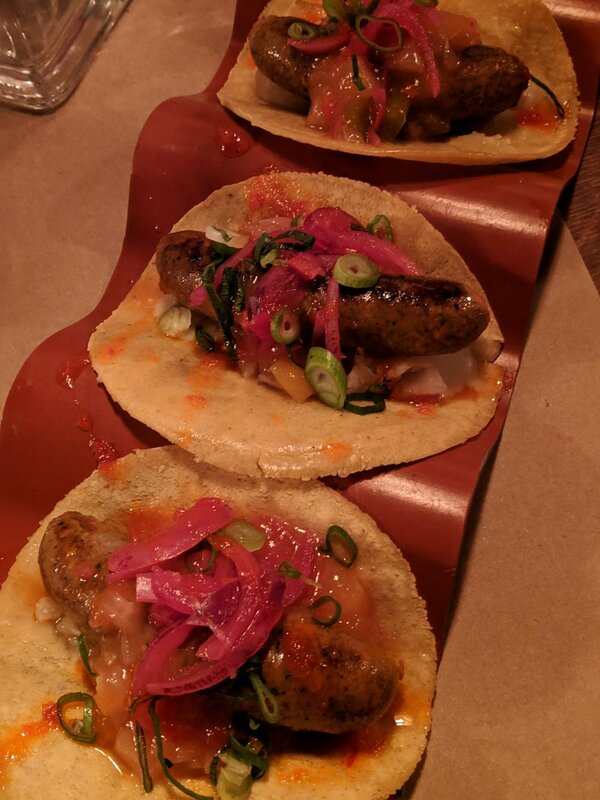 If you’re used to the kind of genuine Mexican food you get on the West coast or in major cities like London, you’re likely to be disappointed by Mez Cais. There are 2 of these in Lisbon, one in the LX Factory and another on the “pink street” — the music and atmosphere is really fun at the LX Factory location and I didn’t try the other. Cocktails average at €5 so the food is more of a side note anyway. The menu is labelled gluten free and they do use good quality corn tacos. I asked for hot sauce which almost blew my head off, but it added some much needed oomph to an otherwise tasteless taco. Still recommend it though as it is fun. Whilst not the best tacos I have ever eaten, El Clandestino has a good selection of gluten free corn tortillas, the flavours are interesting and there’s definitely some flavours combos you probably won’t try anywhere else in the world! Good allergy/coeliac knowledge and great margaritas, this place is pretty excellently reviews so I would say are probably the best tacos in Lisbon! I was very excited to check out the aquarium and it’s one of the best I’ve been to. But be careful not to get stuck in this part of town if you’re hungry. Originally developed for Expo '98, the swarming mass of modern architecture and oddly placed cable car are definitely interesting but the slightly dilapidated selection of restaurants don’t offer anything decent in the way of gluten free options. My advice is to check out the aquarium, try the cable car and then get the hell outta there! The coffee is pretty good but somehow the temperature inside is about 10 degrees higher than outside and even though Google shows some images of supposedly gluten free food, they couldn’t do anything except shake their heads. There was nothing available and it was a 15 minute walk back into town. Sometimes you might feel like adding some heat to an already hot Airbnb so you'll need to know where to get some gluten free staples. Finding supermarkets in Lisbon is hard enough already, let alone ones that stock anything relevant. Here's a list that will save you time hunting for gluten free foodstuffs. Credit cards accepted at all of these. This place is in the same vicinity as the health food shop Celeiro (some kind of mega mall out of the city centre) which does have a good selection (but with higher prices than average). Save yourself about a euro per Scharrs loaf and get it all from Jumbo, the selection is incredible for any supermarket. They also have amazing and diverse Portuguese produce including lots of fresh fruit and veg. If you were looking to satiate your avocado fix, you can do it here with ripe avocados the size of the sun and limes the size of peas. Great variety for such a small shop, prices are on the high side and doesn’t really stray from the Scharr brand, although they had some new products from them that I hadn’t seen before including multipacks of sliced (regular sized) bread. Worth a visit, but bring your credit card. Definitely not worth your time for anything beyond a bit of salted fish if that’s your thing. The gluten free selection was… bordering on nothing. No bread or any real sustenance, you might be able to buy a bag of potato chips and some mosquito repellent if you’re lucky. The most prolific grocery store in Lisbon, not really worth a visit for much more than basic staples like eggs and water. Couldn’t see anything, gluten free or otherwise. Maybe they were expecting stock but from my memory, the entire contents of the supermarket consisted of a kitchen roll and 2 bottles of water. I bought the water.